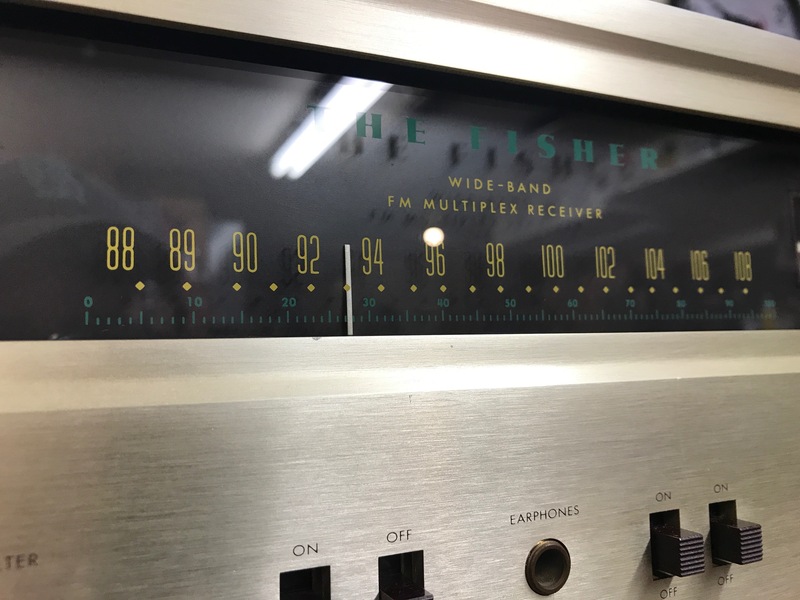 We had the chance recently to restore a lot of units we had sitting around for a while, this Fisher 400 being one of them. 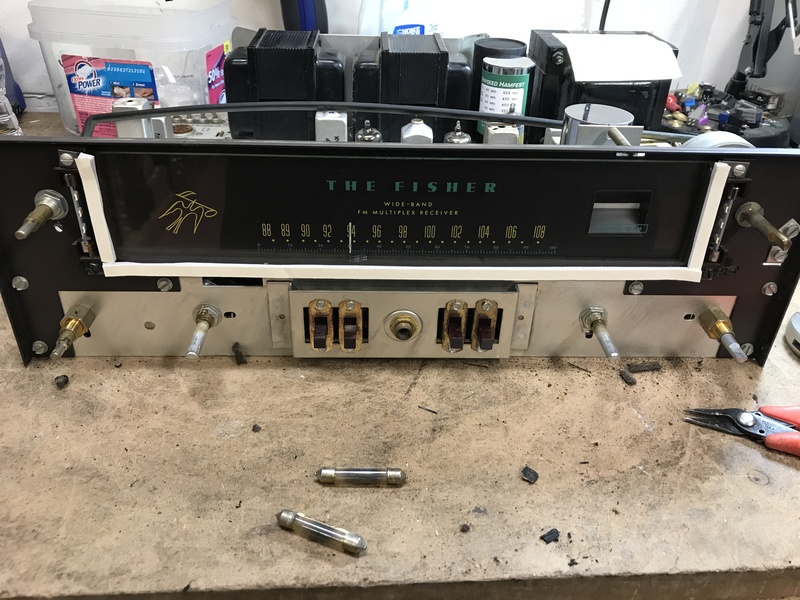 We actually have another Fisher 400 that will also be getting this very same restoration. This unit will be for sale in our store very soon! 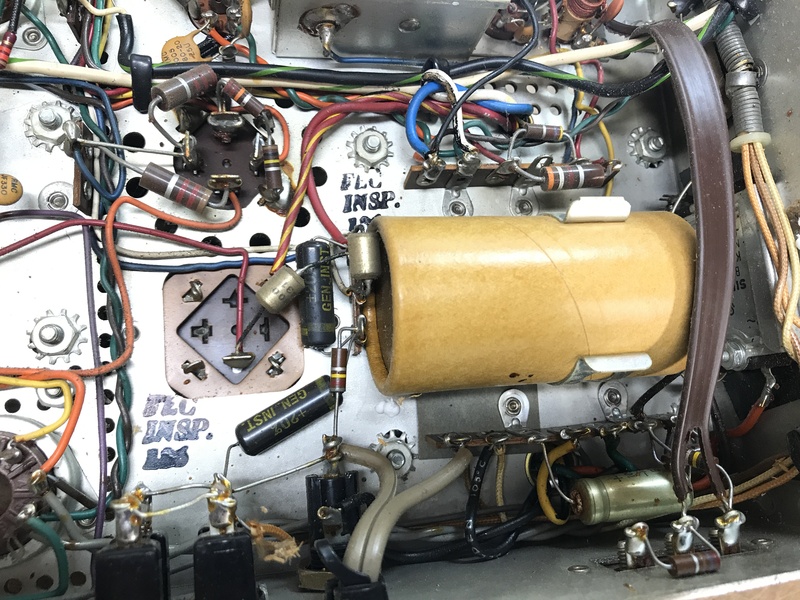 This unit was in original condition, with two broken switches (filter and loudness). 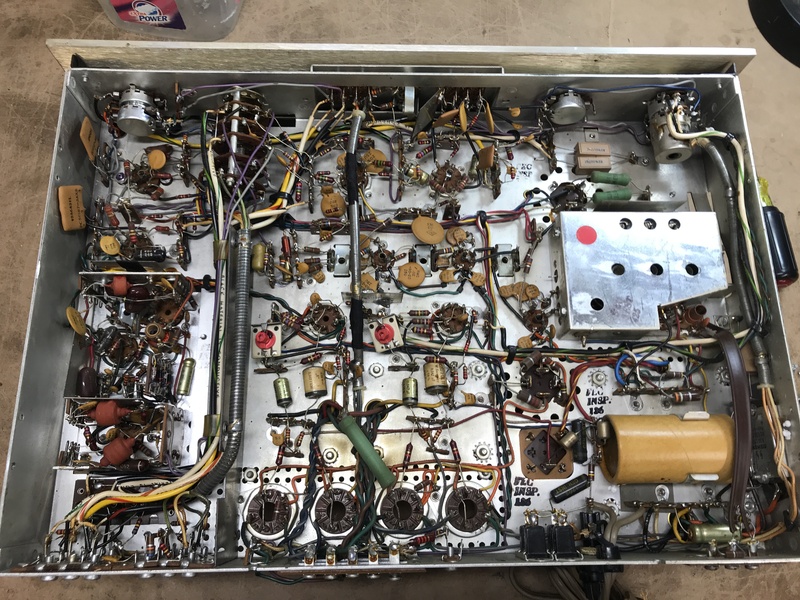 It was traded in a while ago towards some Heathkit monoblock amps we had from a HUGE collection we sold on consignment. It was a little dirty but was evident that it would clean up and be a good candidate for a full restoration. 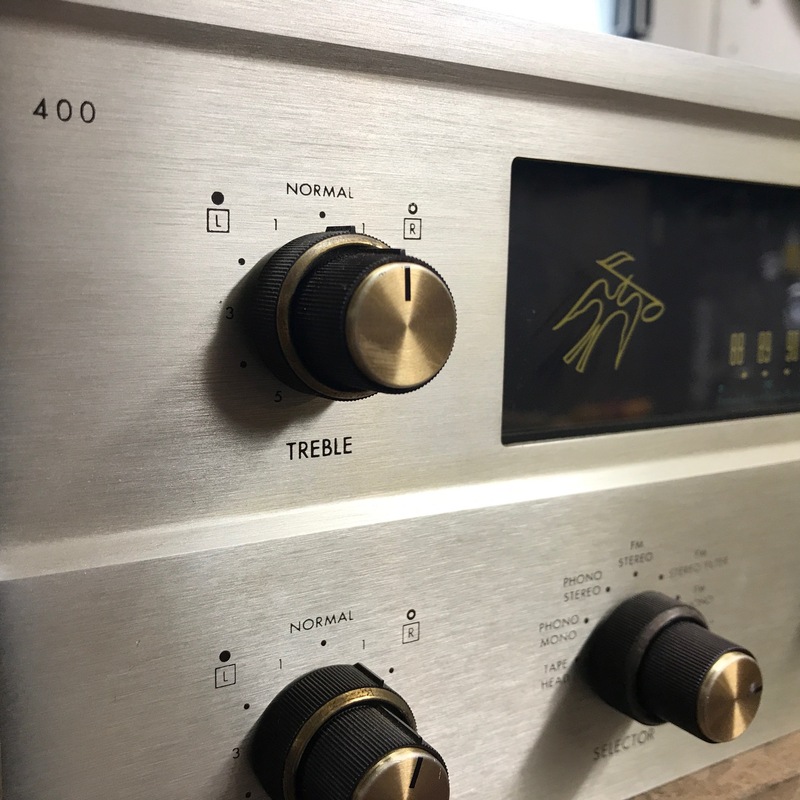 These units get a very similar restoration to the Fisher 500C that we documented a few weeks ago, which was purchased and sent to its new home in California! 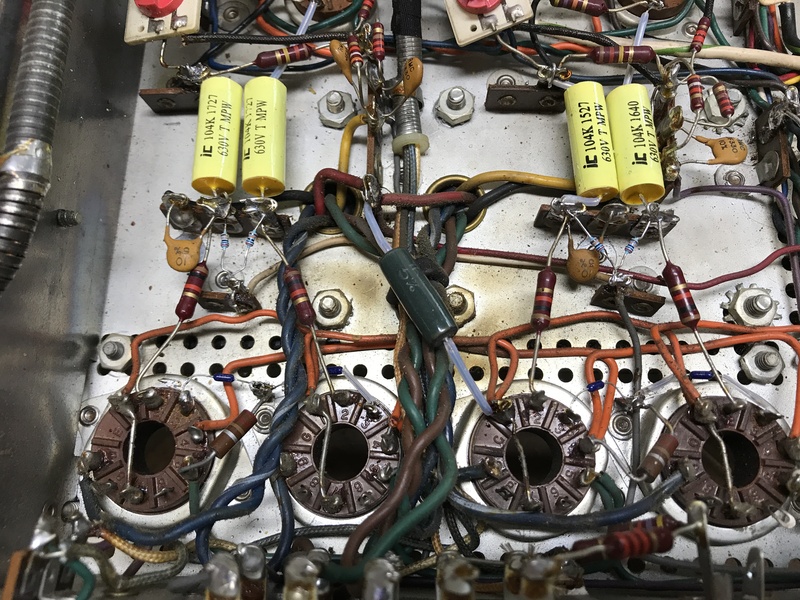 This will involve the normal restoration work, a few modifications for safer, more reliable use, and a minor repair to fix the broken switches. First thing, to get the tedious part out of the way, will be the broken switches. The original controls get dirty and become difficult to impossible to use, unless you spray some DeOxit in to break up the crud. They become brittle over time, and if you force them, they will snap. Luckily we have a few Fisher parts units laying around. Carefully the old ones were unsoldered from their connections and removed. You can see how they snapped from being pressed too hard. 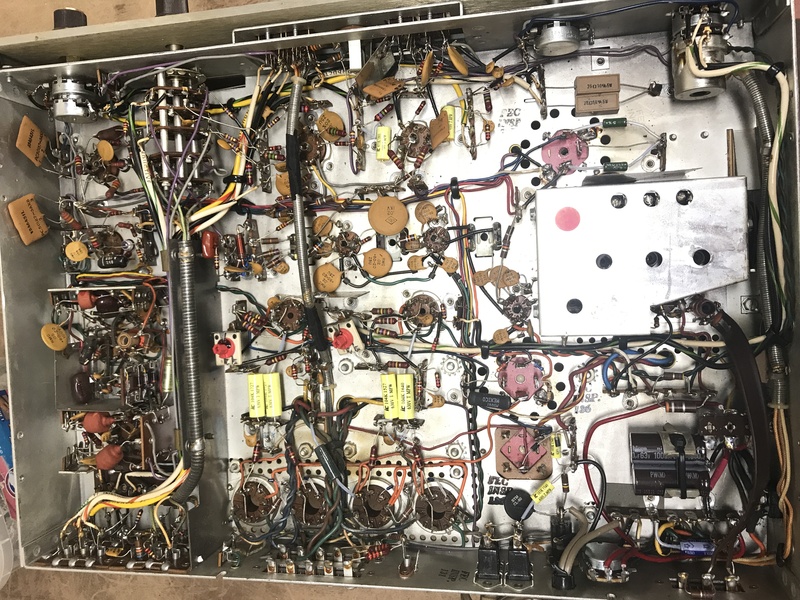 On the right, you can see the tight mess of components and connections behind the controls. Once free, the controls come out with two screws each, and the spares go right in. 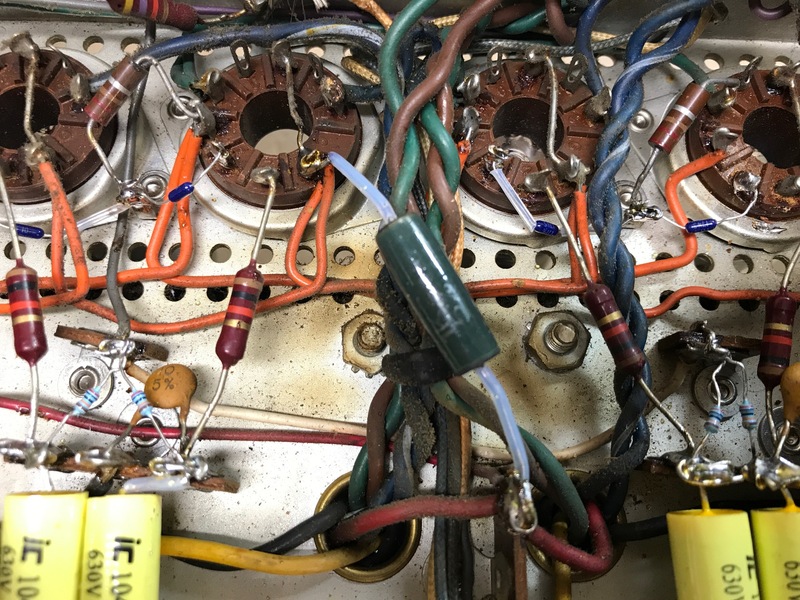 Make sure to connect the control back in correctly to avoid problems. The power supply multi-section can capacitors are next. As with the Fisher 500, the 400 will get a Hayseed cap kit. These are custom made as drop-in replacements for the originals. Even though they are drop in replacements, there is a lot of time involved to put in each cap… about an hour each. There are 4 of them. The 1000/1000 µf cap underneath the unit takes a bit more time as there are many other components near it that also get changed. 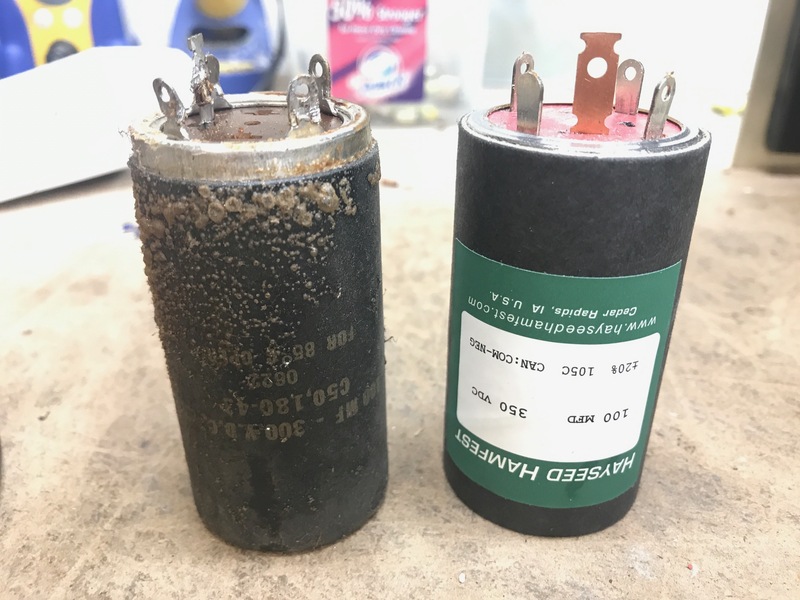 The tubes create so much heat near the paper wrapped can cap, it boiled the wax off the old capacitor. The paper wrap actually pulled right off when I tried removing the cap from the chassis. Here is the underside of the power supply section before any work is done. 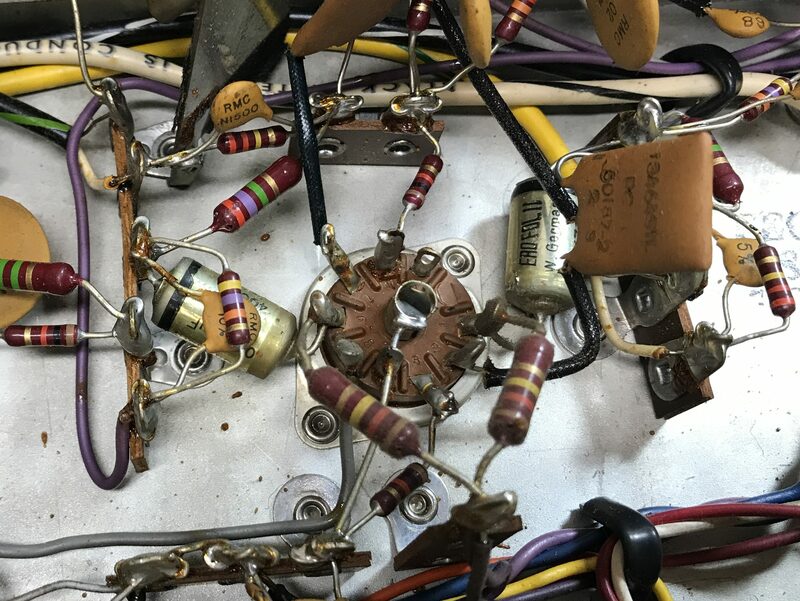 You can see the original diodes, the 1000/1000 µF cardboard cap, the rectifier, bumblebee caps, dropping resistors, etc. Most of this will get swapped out. 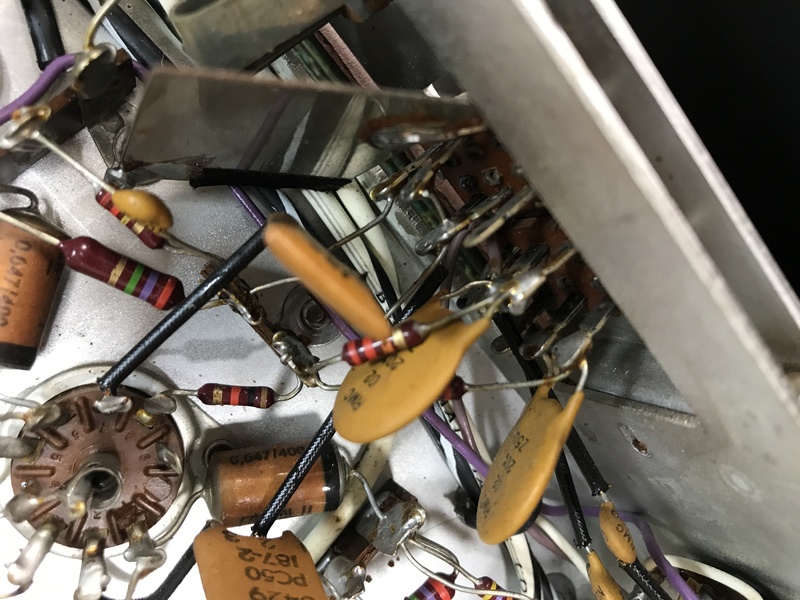 This is the 40/40/40/20 µF capacitor from underneath. The cap, along with all the dropping resistors get changed to new. The new capacitor has the same pin out, so the resistor values remain in the same order. 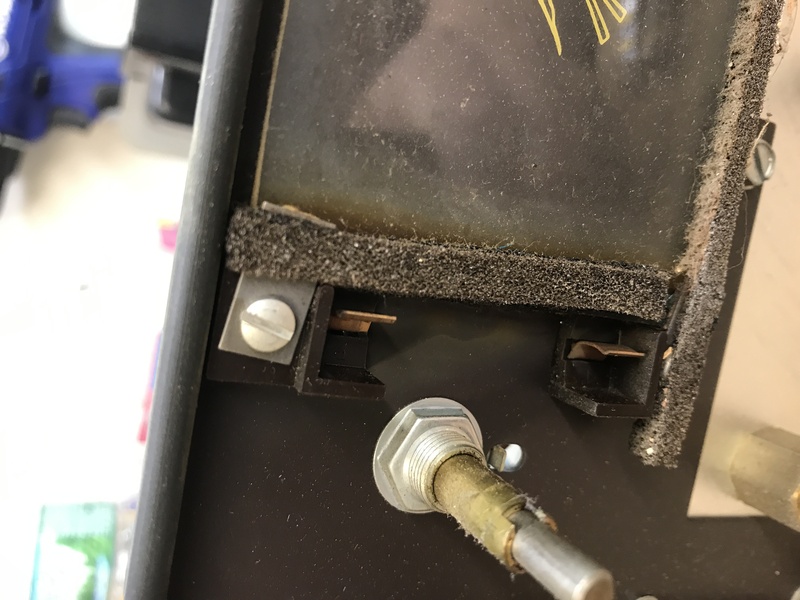 Lots of heat is needed to free up the grounding tabs from the chassis, and a lot of heat is needed to get a solid connection back to the chassis. 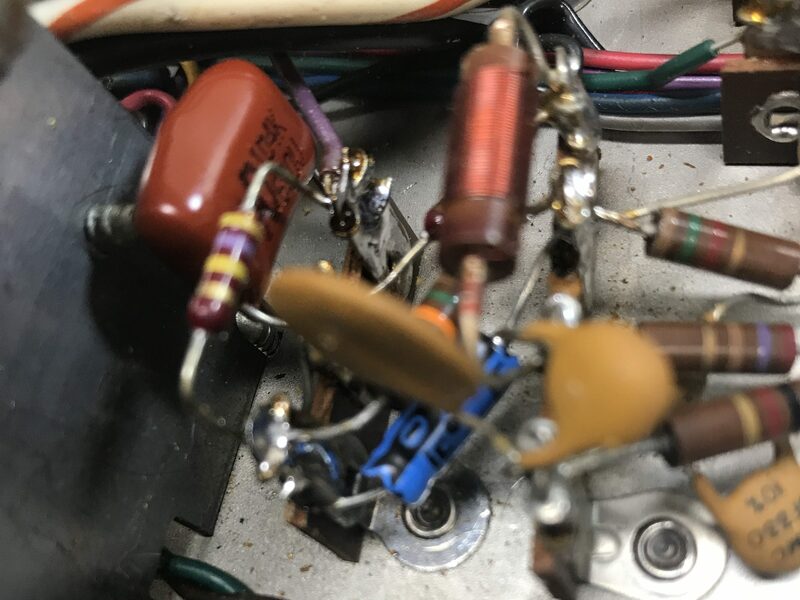 Make sure the dropping resistors going back in are not only the correct impedance but also the correct wattage rating. This is 100 µF cap. 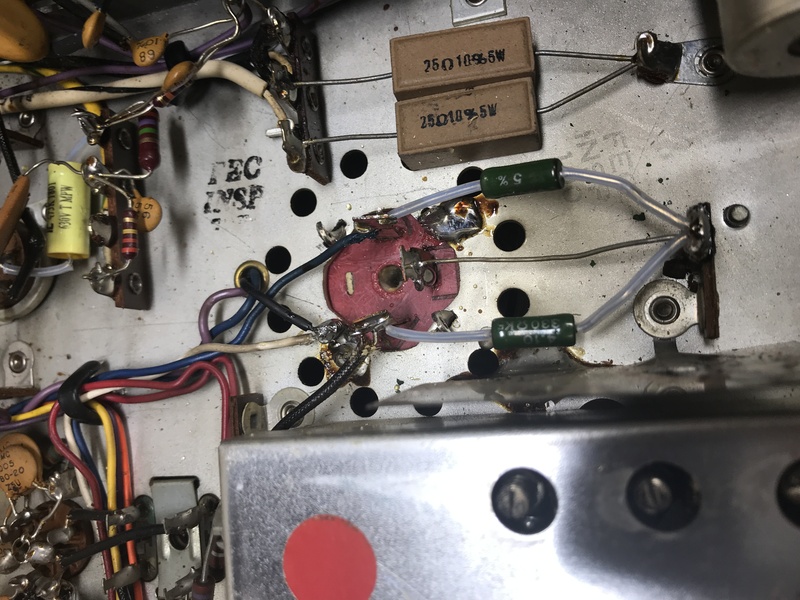 You can see that the diodes were replaced, as well as both 0.01 µF caps on that terminal strip. This is the paper wrapped cap on the top side of the chassis pictured above. On the bottom of the picture you can see the CL-80 thermistor added to the unit for soft-startup. This is the large 1.2K Ω, 7 Watt (you read that correctly) resistor dropping voltage between the 100 µF cap and the 40/40/40/20 µF cap. These often come in on original units all burned up, value drifted, and sometimes cracked or completely split in half. As you can see, this is also a 7 watt resistor. 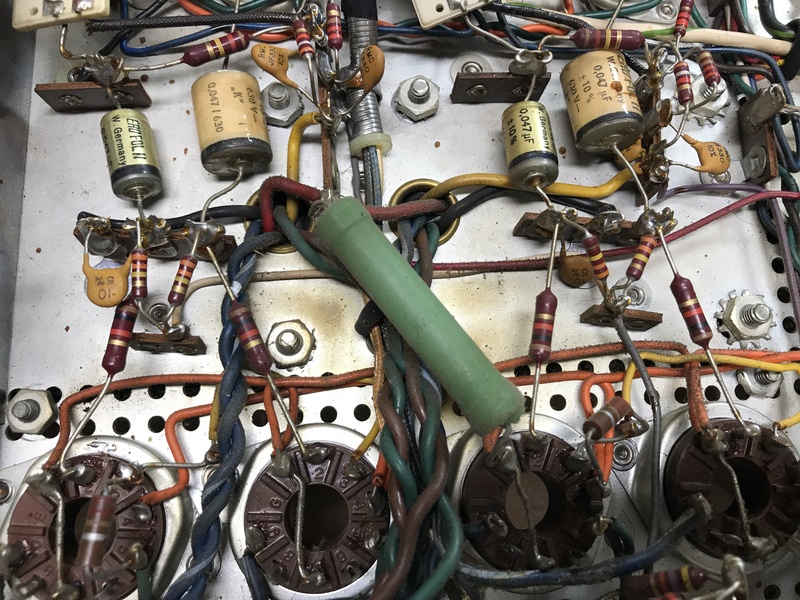 All components are much smaller today than in the past, not just electrolytics. This is the 200/50/50 µF cap mounted towards the front of the unit. Both 330 Ω dropping resistors will be replaced as well as the multi-section cap. The resistors are rated at 3 watts, so these are pretty heavy duty as well. The originals are glass, as per the manual. These new green ones are wire-wound Vishay resistors. 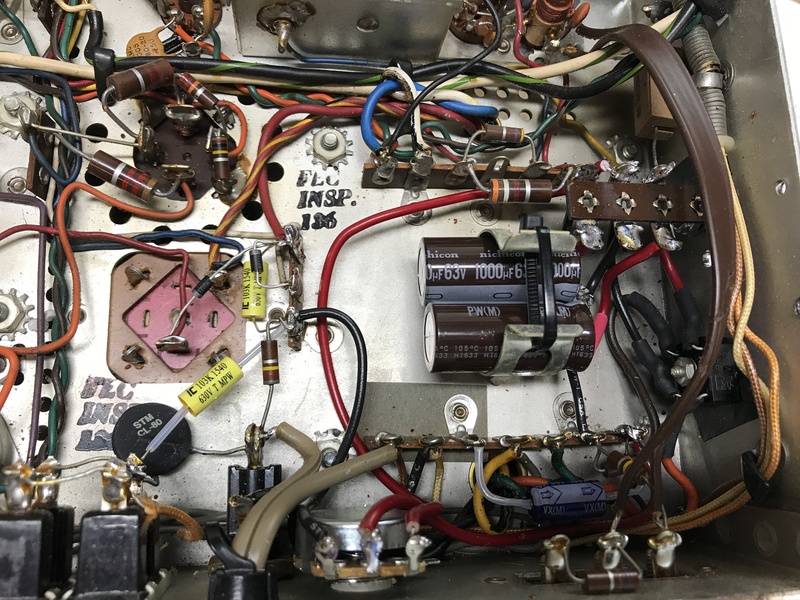 This is the multi-section capacitor that takes the most work. It is the 1000/1000 μF cap in the bias circuit. 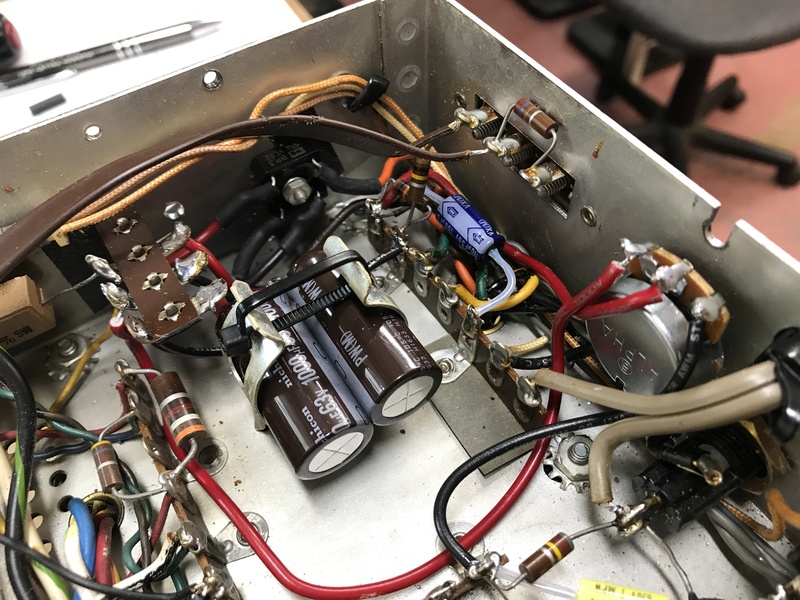 We had used the 1000/1000 μF from the Hayseed cap kit we had on hand in a pinch while restoring a Sansui SP-220 preamp recently. However, we have plenty of electrolytics at common values on hand. We used two separate 1000 μF/63V caps with the negatives tied together as the original cap was common negative. 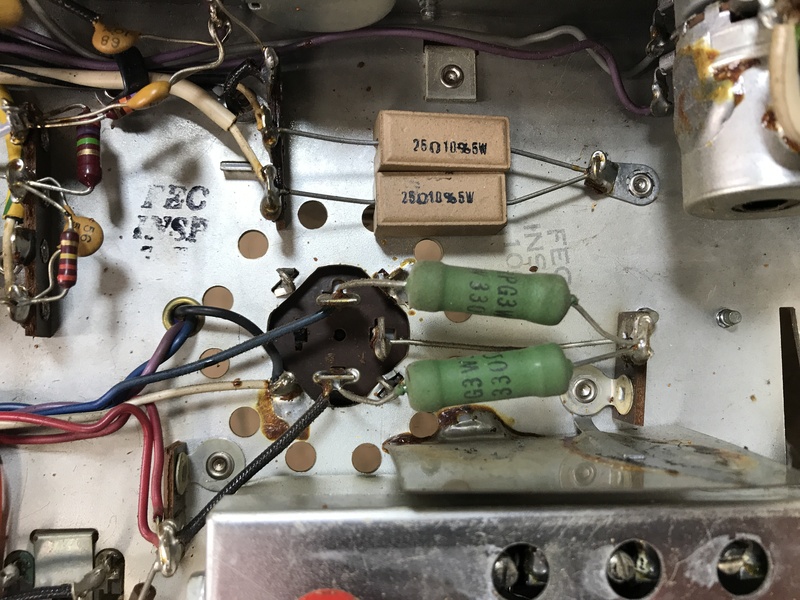 The selenium rectifier you can see mounted to the side of the unit will also get replaced. The 5.6K Ω bias resistor attached to the negatives of these caps will also be modified so the unit will have adjustable bias. The small 100 μF cap on the bias circuit also gets changed with a new Nichicon axial cap. A nice terminal strip will tie in all these connections, mounted to the chassis. It is very important to sketch a little schematic to write down all the locations, connections, and values of everything before you disassemble the rectifier and the can cap. Taking a ton of pictures will also help you sort out where everything goes when you install all the new parts. 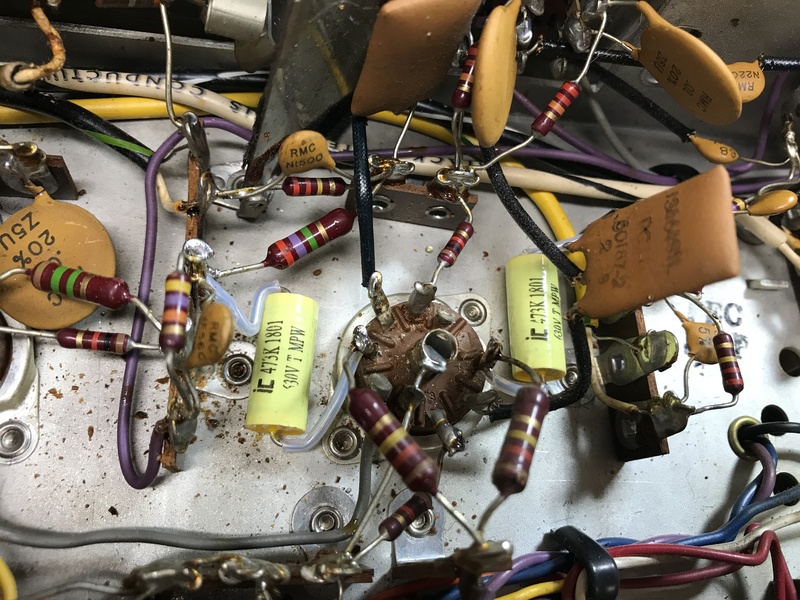 Once the area is clear, the first thing I do is replace the old selenium rectifier with a new 600v bridge rectifier. 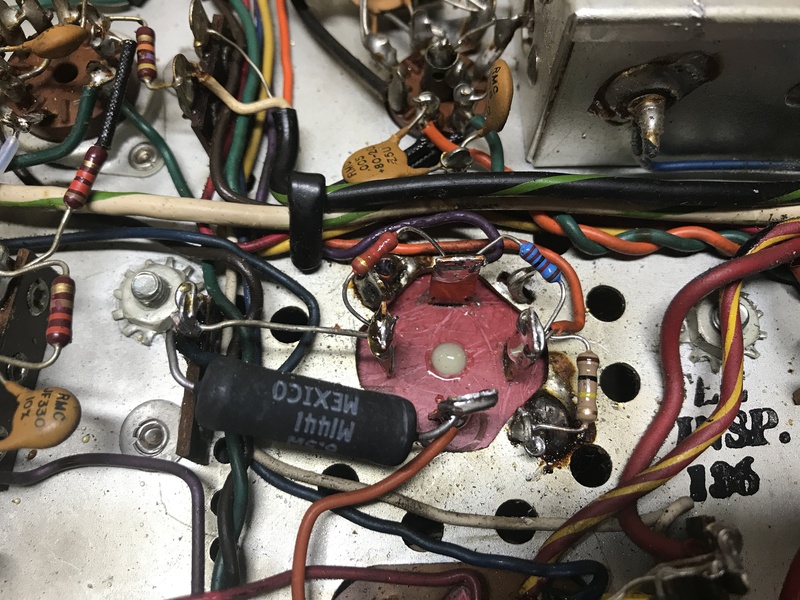 Doing this before the can cap is better because there’s more room to work, and you can use the two previous holes in the chassis from the selenium rectifier to mount the new diode bridge rectifier in one hole, and the terminal strip in the other. 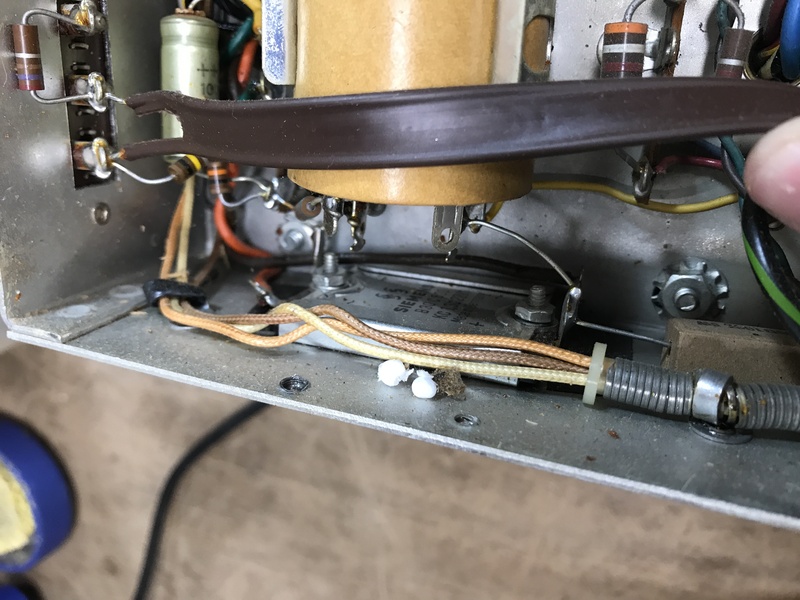 Make sure the rectifier connections are well covered and away from any other contacts and the chassis. 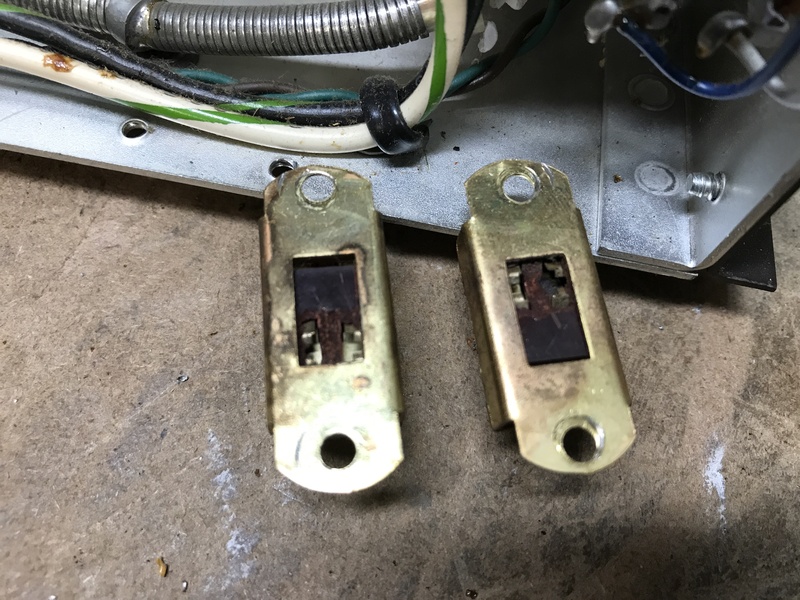 The terminal strip must have three connections separate from the chassis mount flange… Two positive connections, and the shared negative. The 1000 μF caps, with the negatives twisted and soldered together, fit well enough in the same clamp on their own. A zip tie was added to make sure they don’t float around inside. The 100 μF axial, in blue, fits right in to the same corner as before. The old 5.6K Ω bias resistor was removed completely, and a 10K Ω potentiometer is added for adjustable bias. It is mounted to a new hole that will need to be drilled out in the back of the chassis. There is enough room next to the power chord and fuse. 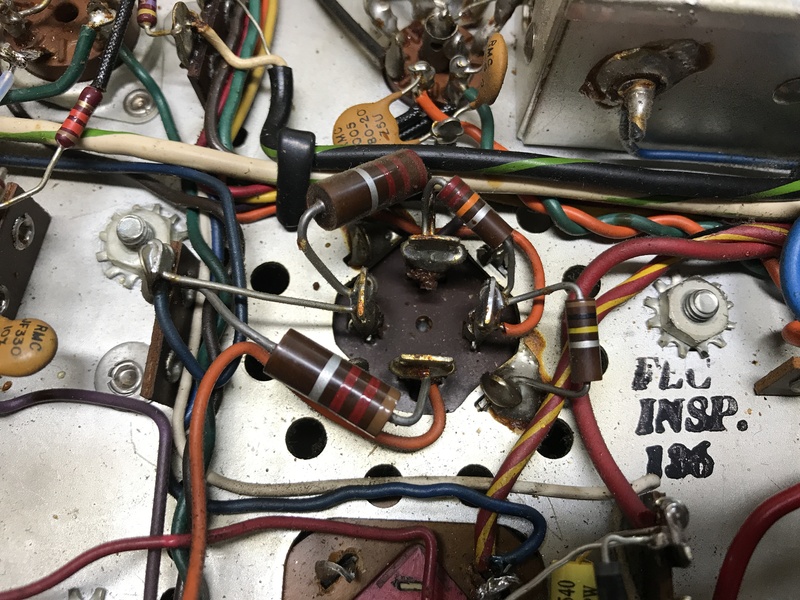 The bias pot has 3 connections, the black goes to ground for the control, and the two red connections go to the same points in the circuit as the original resistor. 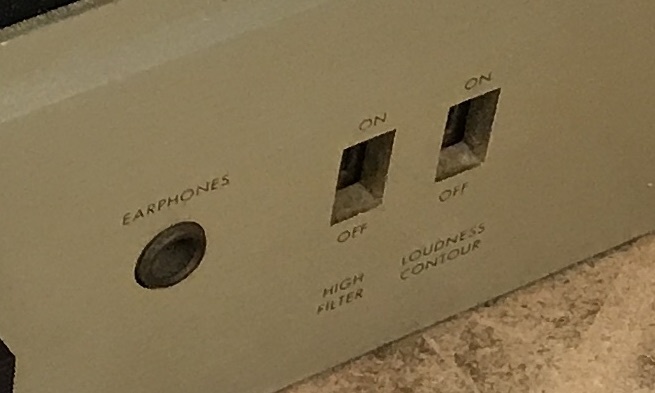 The power amp section gets a few modifications as well. Just like the 500, the Fisher 400s get the coupling caps (yellow) upgraded from .047 μF to .1 μF to handle the slightly different, new production, 7868 power tubes. 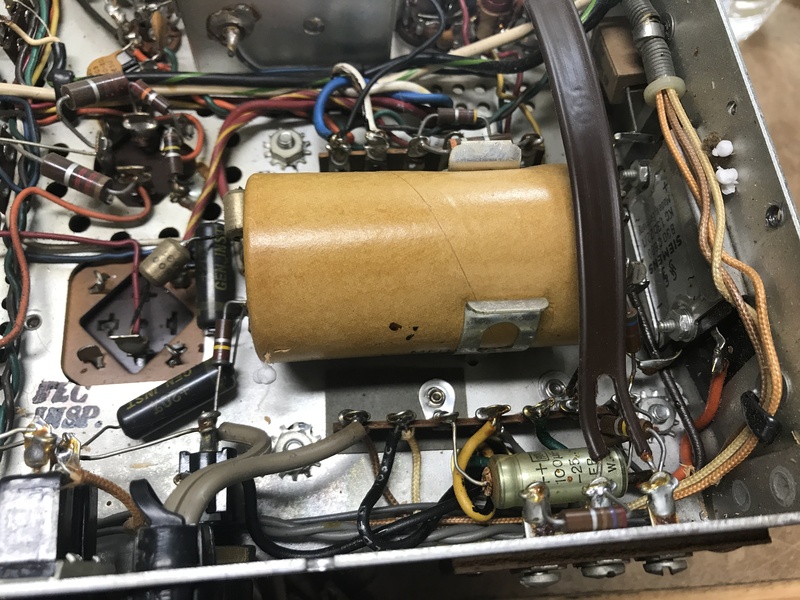 This unit came in without power tubes… So a brand new, matched quad of 7868 Electro-Harmonix will be put in before it goes up for sale. 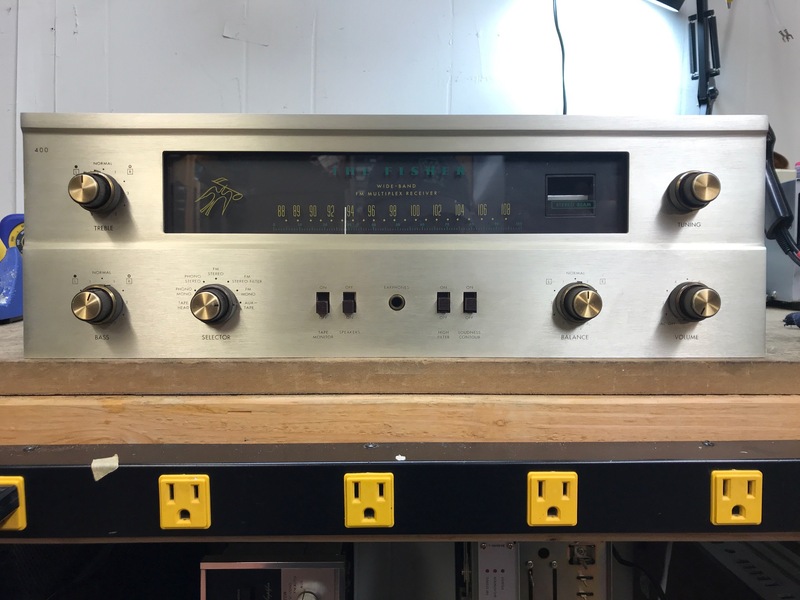 Just as with the Fisher 500, this will have the original 330k Ω grid resistors changed as well. These are lowered to 200k Ω resistors (light blue) to better run the new production tubes. Just like the 5… You get it… The Fisher 400 also gets 10 Ω resistors (dark blue) added between the cathode and ground. These help to easily measure bias for each tube, across the resistor. 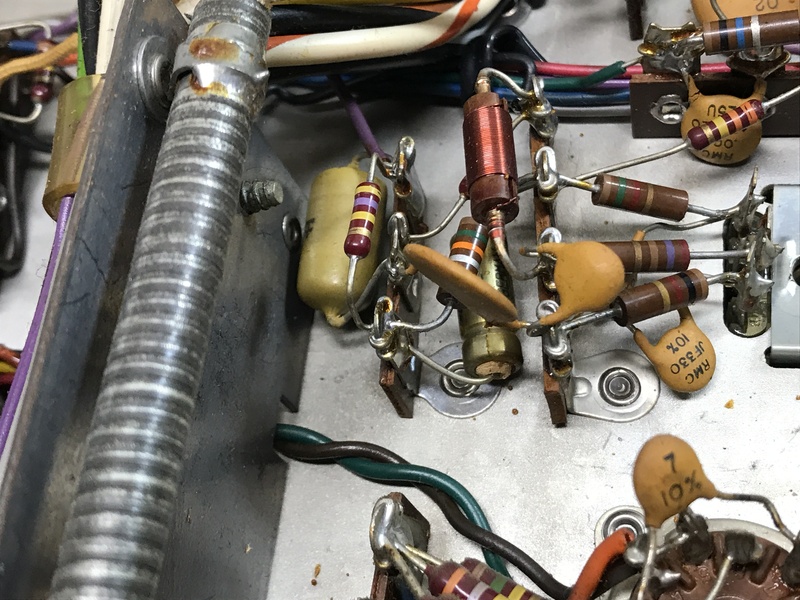 Another huge benefit is that should a power tube short, the resistor will blow and protect the output transformer. Also, that big green 7 Watt resistor is one of the dropping resistors in the power supply. A few other caps get swapped out. A small film cap (C47) and the C55 (8 μf) electrolytic cap near the preamp. 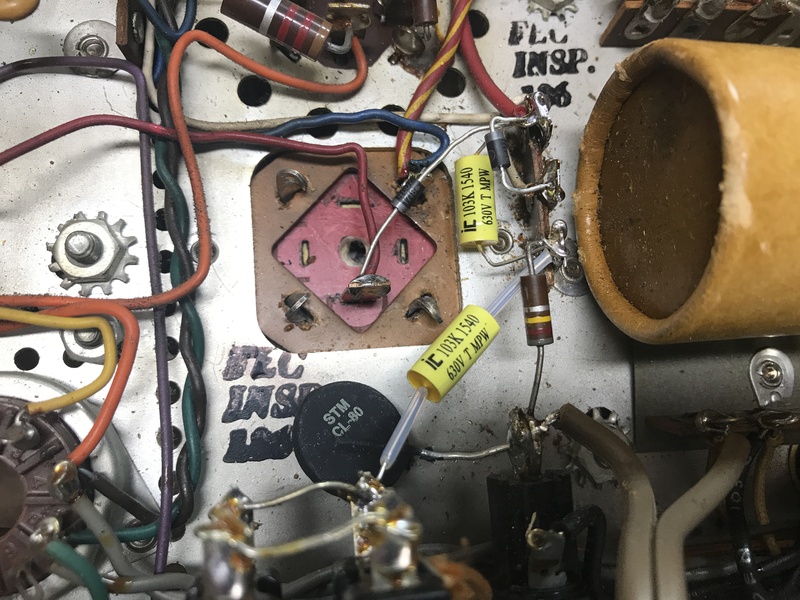 The phono preamp coupling caps also get replaced… Two .047 μF film caps. The controls get their normal cleaning as well. DeOxit on the pots, contact cleaner on the selectors. The faceplate got cleaned up next. Just a simple cleaning solution takes all those decades of grunge, dirt, and dust. Be careful when you clean around any of the lettering. It was screen-printed, and is somewhat delicate. The glass was very dirty and the foam surrounding it, preventing light leakage, needed replacing anyways. The foam was replaced, and the glass was cleaned. When cleaning the rear side of the glass, avoid the lettering if you can. It is very delicately painted on, and will come off pretty easy. The glass ended up looking incredible after an easy cleaning. The knobs were in great condition for their age, and all the original brass caps were there and still look good!